SentiWordNet Projects is an important open source opinion mining tool. We offer sentiwordnet academic projects to use syn-set for analyze negativity, positivity and input sentence objective. Sentiwordnet is the important extension of Word-net. We use sentiwordNet tool for sentiment classification and open mining application. Using sentiWordnet tool, we implemented 90+ projects in text mining, web mining, data mining, web service discovery projects to analyze correlation among user queries and database information. To capture positive and negative words in chat history (or) feedback comments we use this tool in social network based projects and recommendation system based projects. We use sentiment analysis process in Senti Word Net to gains human thought, their views, emotions and attitudes. Sentiword Net is used by natural language processing and computational techniques to receive sentiments from typical unstructured text. Voter’s view is know-er by politician. Consumer information like product view. Social network utilize the mind and status of individual (or) communities. Consumer attitude and trends in online marketing. Proper decision is not taken for selected features such as phrase, words and sentences. This process is very harder than typical classification process. Depends on domain and context. Have a doubt to provide interpretation for sentiment detection. It contains a set of word with lexicons, paragraph structure and syntactic patterns. SentiWord Net 1.0: globally available to user and developed for research applications. SentiWord Net 1.1: Technical reports are analyzed and not published. 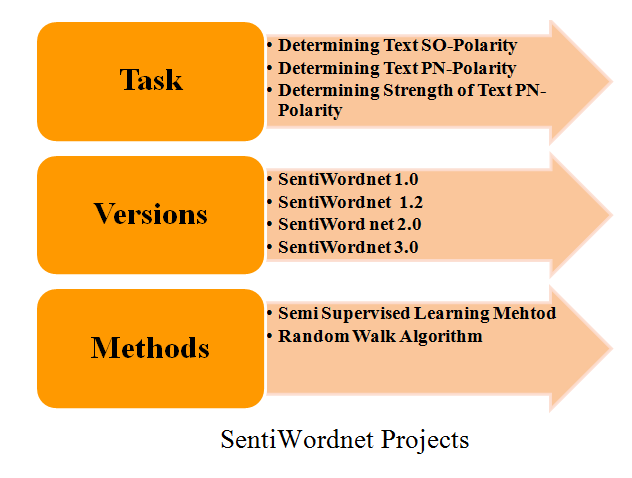 Senti Word Net 3.0: Composed of both random walk and semi supervised method for opinion mining. We use semi supervised learning method for synset classification purpose. We label synset manually and expanded by automatic annotation. We use this technique to minimize labeling errors. Unhappy, sad => negative words. Happy, good => positive words. Each word denote as syn-set which is the basic element in semi supervised classification method. We use this algorithm to build SentiWord Net which process opinion mining application in graph based model. We assign weights for each node and build vertices among nodes by links. We use this method to analyze relation among synset and glosses of other synset. It predicts opinion based on following steps. If two syn-set share same context which means both synset provide same emotion. Then it is monitor and realized by source synset node to neighbor synset node using this comparison, link denote positivity and negativity. By the links we can easily obtain the high value of positivity and negativity.